Hublot King Power Unico Italia Independent Blue. 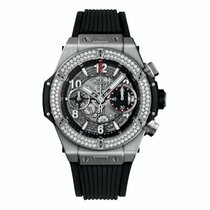 The Big Bang Unico embodies the Hublot brand more than any of the Swiss watch manufacturer's other collections. Its imposing case holds an in-house caliber that can be expanded using modules with GMT or perpetual calendar functions, for example. Unico timepieces from Hublot are imposing: Most of their cases are 45 mm in diameter and 15 mm thick. In spring 2018, the manufacturer added a slightly less intimidating 42-mm model to the Unico collection. The Big Bang Unico isn't concerned with following the norms of conservative watches. Hublot found success by going against the grain with bold, innovative designs. The Big Bang's angular, mechanical appearance breaks with tradition. The Unico is named after its in-house chronograph caliber, which is visible in all models via the skeletonized dial. This movement allows for additional modules and can be outfitted with various functions, such as a flyback chronograph, a second time zone, or a perpetual calendar. Hublot offers the Big Bang Unico in a wide range of case materials such as titanium, ceramic, carbon, King Gold, and even sapphire crystal. An exclusive, new material is Magic Gold, a unique patented alloy. By combining ceramic and gold, the soft and scratch-prone 18-karat precious metal is hardened to such a level that only a diamond can scratch it. How much does a Big Bang Unico cost? The Unico 45 is the collection's flagship model. There are many versions of this 45-mm flyback chronograph. The least expensive models are made of titanium or ceramic and cost around 15,200 USD. One exception is the bright red ceramic model from early 2018, which goes for about 21,000 USD. If you prefer gold watches, you may enjoy the versions in King or Magic Gold. These pieces demand around 29,200 USD. Expect to pay anywhere from 46,500 to 64,500 USD for a Unico 45 in sapphire crystal. Models with diamonds sit at the top of the price range, costing between 73,500 and 90,000 USD. Introduced at Baselworld 2018, the 42-mm editions of the Big Bang Unico are currently only available in titanium, King Gold, or a combination thereof and come with a ceramic bezel. Hublot completely redesigned the Unico movement for these timepieces. They were able to make it 1.3 mm flatter without losing any of its 72-hour power reserve or functionality. Prices for a Unico 42 fall into a range similar to that of the larger models: Titanium pieces go for about 16,400 USD, while those in gold sell for over 38,500 USD. In the Unico GMT, Hublot replaced the chronograph function with a second time zone. The time in the other time zone is displayed using an additional hour hand and a day-night disc. The timepiece has retained the two chronograph pushers, which are used here to set the main time display forward or backward by an hour. The Unico GMT comes in titanium, carbon, or King Gold with prices ranging from 16,500 to 29,500 USD, depending on the material. The Perpetual Calendar is yet another interesting take on the Big Bang Unico. Not only can it function as a stopwatch, it also comes with a perpetual calendar equipped with a moon phase display. Two small pushers hidden beneath the bezel are used to set the date, while the two large pushers operate the chronograph. A Unico Perpetual Calendar with a carbon case costs about 48,000 USD. Variants in King Gold and Magic Gold come in at 58,500 and 70,500 USD, respectively. Sapphire models are the most expensive at around 90,000 USD. A Unico movement also powers the Big Bang Ferrari Unico, which was designed in large part by Ferrari's Senior Vice President of Design, Flavio Manzoni. Not only is this watch reminiscent of the cockpit of an Italian sports car, it is also adorned with the famous Cavallino Rampante ("prancing horse") logo. The chronograph's minute counter resembles the rev counter of a Ferrari, and the rotor looks like a sports car's wheel rim. Depending on if you choose a titanium, carbon, or gold model, these sport timepieces cost between 21,000 and 35,000 USD. Hublot is always releasing extremely limited edition versions of the Big Bang Unico. There have been special edition models for the European Cup, the UEFA Champions League, and the FIFA World Cup. Some teams even have their own models dedicated to them, including FC Bayern München and Juventus Turin. The Unico Depeche Mode, created in collaboration with the eponymous pioneering synth-pop band, is also a coveted collector's item. Hublot has even thought of golfers and come up with the Unico Golf, which can count strokes, holes, and games. These special edition models tend to cost anywhere from 20,000 to 29,500 USD. The caliber HUB1242 is at the heart of the Big Bang Unico. Hublot developed the movement over a period of four years. It's comprised of 330 pieces set together by hand and has a balance frequency of 28,800 alternations per hour. It also has a 72-hour power reserve. The movement is constructed in such a way that various complications and modules can be added, such as a GMT function, flyback chronograph, a perpetual calendar, and a bi-retrograde chronograph. The Unico is representative of the entire Big Bang collection. 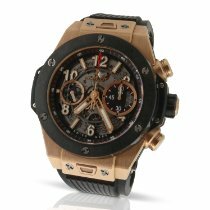 This series has been Hublot's flagship since 2005 and has played a significant role in the brand's success. Combining different materials is a central element of Hublot's philosophy. In 1980, Hublot gained notoriety by being the first manufacturer to combine rubber and gold in a watch. This famously unconventional pairing of rubber straps with gold watches marked the beginning of their fusion concept, which continues to be one of their hallmarks to this day. Hublot watches are designed to resemble portholes, as the name Hublot – the French word for "porthole" – suggests. The watches are characterized by a distinctive wide bezel with visible, H-shaped screws.